American Airlines Flight 587 was scheduled to leave New York-JFK at 08:00 for a flight to Santo Domingo, Dominican Republic. The boarding process at gate 22 took a little longer than planned due to additional security procedures that delayed boarding. The gate was closed at 08:38 and pushback from the gate was accomplished at 09:00. The crew taxied to runway 31L behind Japan Air Lines Flight 047, a Boeing 747-400 bound for Tokyo-Narita. JL047 was cleared for takeoff at 09:11:08 but started it's takeoff roll one minute later. While JL047 was still preparing for takeoff, the tower controller called AA587, cautioned the flight crew about wake turbulence and instructed them to taxi into position and hold on runway 31L: "American five eighty seven heavy Kennedy tower, caution wake turbulence runway three one left, taxi into position and hold". A little later the JAL Boeing 747 rotated and initiated a climbing left turn over Jamaica Bay (the "bridge departure"). Then, at 09:13:27 Flight 587 was cleared for takeoff: "American five eight seven heavy, wind three zero zero at niner, runway three one left, cleared for takeoff". Takeoff roll was initiated about 09:14, circa 1 minutes and 45 seconds following the 747. After leaving the ground the landing gear was retracted at 09:14:34. The tower controller then cleared the crew for the bridge departure: "American five eight seven heavy, turn left. fly the Bridge Climb. Contact New York departure. Good morning." Flight 587 contacted the ARTCC controller about 09:15, and stated they were climbing out of 1,300 feet for 5,000 feet. The controller responded by clearing the flight to climb to 13,000 feet, turn left, and proceed direct to WAVEY. At that moment, while in a climbing left turn, the crew heard a brief squeak and a rattling sound, possibly caused by wake turbulence. Some fifteen seconds later the Airbus began to yaw to the right. Full right and left rudder were applied and the first officer called for "max power" at 09:15:54. Again full right and left rudder were applied and sounds of a snap, a thump and a loud bang were heard when the rudder travelled full right again. The entire vertical tail fin had separated and the Airbus entered an uncontrolled descent from an altitude of about 2500 feet. During this descent both engines separated from the wings coming down within 100 feet of each other near the Newport Avenue / Beach 129th Street crossroads. The aircraft crashed into Beach 131 Street, a Queens residential area. PROBABLE CAUSE: "The in-flight separation of the vertical stabilizer as a result of the loads beyond ultimate design that were created by the first officer’s unnecessary and excessive rudder pedal inputs. Contributing to these rudder pedal inputs were characteristics of the A300-600 rudder system design and elements of the American Airlines Advanced Aircraft Maneuvering Program. " American Airlines carried out sample inspections among its remaining 34 Airbus A300s to ensure there are no problems with other tail assemblies. 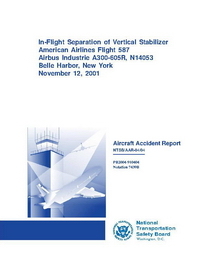 On February 8, 2002, the NTSB in cooperation with the BEA issued two safety recommendations (A-02-01 and A-02-02) that aircraft manufacturers re-emphasize the structural certification requirements for the rudder and vertical stabilizer, showing how some maneuvers can result in exceeding design limits and even lead to structural failure. As a result of these safety recommendations, Airbus Issued an FCOM bulletin dated March 2002 and American Airlines issued a Flight Operations Technical Bulletin addressing the same issues. Distance from New York-John F. Kennedy International Airport, NY to Santo Domingo-Las Américas José Francisco Peña Gómez Int'l Airport as the crow flies is 2483 km (1552 miles).